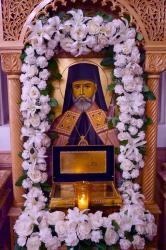 The jubilee year in honor of the 100th anniversary of the repose of St. Raphael of Brooklyn reached its apex with the celebration of the Feast of St. Raphael in the Archdiocesan Cathedral of St. Nicholas in Brooklyn, NY, on November 6–7, 2015. St. Nicholas is the first parish community established by the saint in 1895. 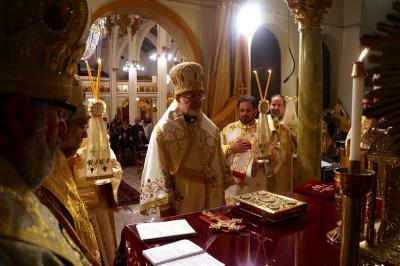 His Eminence Metropolitan Joseph presided at Great Vespers on Friday evening and Festal Orthros and the Hierarchical Divine Liturgy on Saturday morning, assisted by Their Graces, Bishops John and Nicholas of the Antiochian Archdiocese. Metropolitan Hilarion of the Russian Orthodox Church Outside of Russia attended the Great Vespers on Friday evening. Also attending Vespers was good friend and neighbor of the Archdiocese, Bishop Gregory Mansour of the Maronite Church. Father Abraham Malkhasyan represented Archbishop Khajag Barsamian of the Eastern Diocese of the Armenian Church of America at Vespers. Vice-Chairman of the Archdiocese Board of Trustees, Mr. Fawaz El-Khoury, and his wife JoEllen, attended and were joined by other Trustees. At Saturday's Divine Liturgy, His Eminence Archbishop Michael of the Orthodox Church in America (OCA), and His Grace Bishop John of the Moscow Patriarchate, concelebrated with the Antiochian hierarchs. 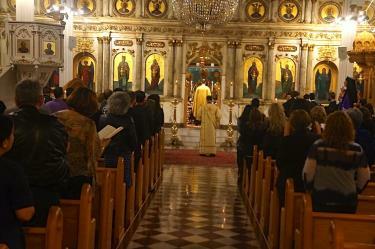 Orthodox faithful of all backgrounds and jurisdictions from the greater New York area attended the services, along with clergy from the entire area. Seminarians from St. Vladimir’s Orthodox Theological Seminary sang with the English Byzantine choir led by the Cathedral Assistant, Fr. Adrian Budica. They also assisted the Cathedral’s Arabic Byzantine choir and regular choral choir. For both Vespers and the Divine Liturgy, Archpriest Chad Hatfield, Chancellor/CEO of St. Vladimir’s Orthodox Theological Seminary, offered inspiring presentations on the life and legacy of St. Raphael. His Eminence Metropolitan Joseph commented that St. Raphael’s legacy was one for all of us, whether bishops, priests, deacons, or faithful, to emulate. Just as he labored for holiness, we are commanded to do the same. During the services, His Eminence wore the engolpion and cross that belonged to St. Raphael, and offered them to the faithful for veneration at the end of each service. The Cathedral Dean, Fr. 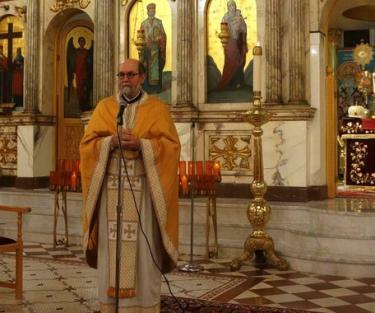 Thomas Zain, welcomed Metropolitan Joseph, the hierarchs and guest clergy, and faithful from as far away as Ottawa, Canada and Texas, to the celebration. Commemorative icons of the feast along with anniversary pins and keychains were distributed to the faithful who attended. A feast day lunch was offered in the Cathedral hall following the Hierarchical Divine Liturgy. Several TV stations and newspapers in the New York area covered this historical event. As the jubilee year draws to an end, we pray that the holy hierarch Raphael will continue to watch over his first community, St. Nicholas Cathedral, and the entire Archdiocese, protecting the clergy and faithful from every attack of the enemy. Holy one of God, intercede for us!